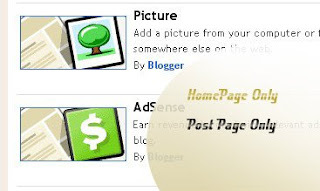 Usually, by default.. when we add a widget item like link units, profile, Archives, Adsense ads,Pictures,etc in Blogger blog , it will be displayed in every page of the blog including the homepage, Permalink pages,etc. As you can see, I installed many widgets in this blog in sidebars like Google ads, Donate Me button ,etc which will be displayed in all the pages of the blog. and select the type of gadget you need and Save the Changes. Next, we have to add a small piece of code to that widget, so.. it only displays in the Homepage. 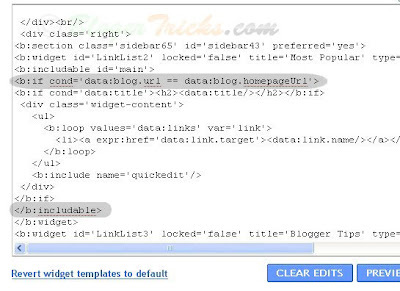 Just go to Edit html and tick on the 'Expand Widget Templates'. (If you want to know exactly what the widget id you need to change, just go to your blog and view the source code and find it. At this point, most of the task is completed.. Just we have to add a small piece of code below that b:includable tag..
and the last thing is, we have to close that b:if tag. Just add this code before the closing tag of b:includable. That's it! and Don't forget to Save the Changes. Now, your desired widget/gadget can only be visible in Homepage. This will allow you to show a specific widget in only the Post Pages and not in the Homepage. Just follow the same tutorial above but replace this code. Like this post or have any questions? Comment here.. Thanks for showing it so clearly. I really like the included screen shot, that helps a lot. Do you have an example for it? This is a great post--thank you! If you want to show the sidebar only in the homepage and not in post pages, what should one do? I tried using your solution, and indeed the texts and widgets do not show in post pages anymore, but the background color of my sidebar still remains. I tried using the b:if code in #sidebar-wrapper and .sidebar widget, but it messes up the template. that's a great post - thank you! what if you only want to show the sidebar in the homepage and not the post pages? with your solution, the texts and page elements in the sidebar indeed disappear in the post pages, but the sidebar background color gets left behind. i tried applying the b:if code in #sidebar-wrapper and .sidebar widget, but it messes up the lay-out. That was very useful.. Thanks very much. I was in search of exactly this thing..
You have made it easy to understand with the help of images. (Scheduled outage at 4:00PM PDT on Thursday (3/25)this error is comming in my dashboard. Hi, that's not an error. It is showing on all blogger dashboards..
What that mean is.. the blogger (google) server will be temporarily down on that time. Hi, I have a small problem and i didn't know how to contact U to ask about it,..
How can I add a code in Blogger(New Post) with out activating it? Thanks, My email is "selviaayman@gmail.com"
Thanks Kranthi. I was looking for it, and it really helped me a lot. It's Working with everything instead of adsense code which i require most. I've seen another blog but that will require me to modify adsense code which is not allowed. Any solution? This didn't work for me and I don't know why. Great post! I am definitely going to use this. marvelous ............ and just to say my blog has the remove the get widget button hack and i am using it for that sake. nice post... tq for posting... nice tricks. It's very useful. Thanks for sharing. I need help really bad, now come across you which is pretty good. Just like yours, you have homepage, Blogger template, I want to add contact link in there, but where to write my contact page?How can I add contact link and when visitors click on that, it will load display my contact page. Please help me. You can have a look my blog:http://hotgirlscollection.blogspot.com/. Please be mind the adult content. Thanks. The only problem is that while the contents of the widgets aren't displayed, the widget itself is (if that makes sense). I mean if you have borders around the widget for example, they will still show. Can't get it to work ... is someone willing to take a look at the widget coding I did to maybe see what I have done wrong? I'd be happy to email it. Many thanks! that was perfect.. thanks for the tip.. I have read the same instructions from another site, and have changed my code accordingly, but cannot get my top widget (custom html widget w/video and chat) to only appear on my front page...it still appears at the top of every page!i have checked and double checked to make sure I am selecting the right code and entering the correct new code, and have even put my code with the tutorial side by side and they are exact. Still on every page though!